Posted in Uncategorised on 15th May 2017 by Bridget Hewitt. Here at The Seat Surgeons we take customer safety very seriously. In this line of work if our product is substandard then you, your family and your friends lives could be at risk. You may or may not be aware that many modern day cars have air bags in more places than just the steering wheel. When we manufacture our leather seats we are extremely careful to ensure the correct stitching is used on airbag seams, these are usually in the side of the front seats. We manufacture all our leather interiors using Duerkopp Adler sewing machines and have invested in the latest airbag sewing system. 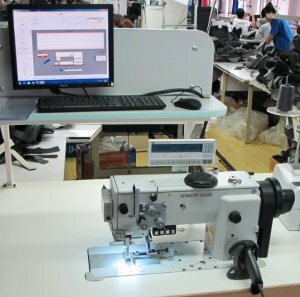 This system comprises of a Duerkopp Adler sewing machine with a computer system and sensor attached that will monitor the tension of the thread, stitch length and quality of airbag seam. This process is so advanced that even if the incorrect thread is used the machine will not operate. 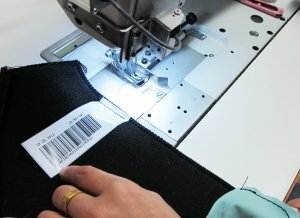 At the end of the process an airbag bar-code label will print out to prove the airbag stitching has passed the safety standards programmed into the machine. We received this e-mail from a customer who unfortunately had an accident recently. Thankfully we use the Durkopp Adler airbag sewing system to ensure our customers safety and in this case, a life. The air bag came out of the side of the seat on both seats rear as well and the window headlining and the dash steering wheel so all worked as they should so grateful as at the time you did state to me that they would work 1000% but you don’t know until something happens like this insurance taken car away now so I’ve brought a new one now so can I have your service once again to do a new trim again but all in black with ivory stitching quilting please forward me a price to do ps.. In the case of a collision an airbag deploys at a speed of around 200 miles per hour. This speed requires the bag to inflate in one-thirtieth of a second, which is far faster than the blink of a human eye. Please beware of trim shops that do not have the proper equipment.